What is Military Neck & How To Fix It Naturally? What Is Military Neck? Military neck is a specific medical condition which relates directly towards the health of your cervical spine. In this specialized condition, straightening of the cervical curve or spine has been seen which sometimes results into pain and other disorders. Doctors suggest that a normal curve of a cervical spine is of ‘C shaped’ which is termed as lordosis. However, the normal curve as seen in an X ray report can be distorted based on several factors. ‘Loss of Lordosis’, is one specific condition which is related to diseases like degeneration of disc or chronic arthritis. As per the observations from senior orthopedic surgeons, it has been noted that, the ‘loss of lordosis’ (commonly referred to as a military neck) is caused as a result of a total alteration of the spine structure in a human body. This is generally seen in people who work with poor neck posture for prolonged period of time. Sometimes, the extreme condition is also referred to as cervical kyphosis or hypolordosis as it relates to the straightening of the cervical curve or military neck. Studies reveal that this is the main cause of getting military neck. It is important to know that, military neck is not a painful condition in all the cases. While in many cases straightened neck is seen without a pain (or very less pain); it can cause immense discomfort as well as pain to many other patients. The problem is generally caused due to pulling of the spine and muscle spasms like in case of whiplash injury or accident. It is therefore important to note that for patients suffering from military neck, cervical spine should be restored in its original condition as soon as possible so that they do not suffer from chronic painful conditions. Also Read: How To Restore Natural Curve In Neck with A Neck Curve Restorer? Symptoms of military neck (also called as straight neck syndrome) can be multifarious. Patients suffering from such chronic condition can experience severe pain concerning upper and lower back area. Some patients can even complaint of nausea and terrible headache/migraines as well. While some patients experience severe military neck pain, it has been observed that such a typical risky medical condition can also give rise to severe immobility. In order to take care or fix such chronic military neck symptoms, it is recommended to go through an X-Ray. X-Ray plate based image can help you to diagnose the intensity of the curve and your doctor can actually plan out for a structured process of treatment after careful examining. 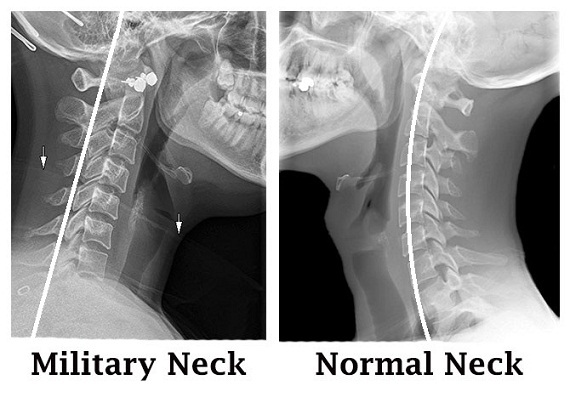 Orthopedic surgeons when consulted, agree to the fact that a military neck X-ray is just a preliminary step to ensure that you suffer from military neck. Based on such symptoms, it is clear that a structured process of treatment is essentially required for patients suffering from loss of curve problem in the cervical region. Although for few patients military neck surgery may be suggested, it is a fact that for many others surgery might not be the only option available. Correction of cervical spine in favor of a surgery based treatment is only suggested when the doctor feels it to be the last option. Otherwise, proper diagnosis along with initial treatment stages can help cure the problem to much extent. Below are some of the best treatment methods that can be utilized to naturally help you fix the straight neck problem. It is quite evident that correcting the cervical curve for a patient suffering from military neck, can be a boon in disguise as it helps the patient to return to a normal course of life. Non-surgical treatment options which include injections, medicines, therapies as well as exercises can help a lot as it brings back the patient on a normal schedule very fast. 1- Initial Support and Therapies: During the initial phase a military neck treatment can be therapy based. This can include neck massage as well. Giving physical support to the patient is very much required so that it can enable the patient to participate in normal activities as well. 2- Exercises: Studies reveal that military neck exercises are of great help for patients and can act as one of the best ways to correct the curve fast in a most natural way. Therefore in order to get immediate relief from military neck or straight neck condition a patient should get in touch with the physical therapist. Physiotherapist can guide you all the way to perform best cervical spine exercises that can heal your no-curve in neck or straight neck problem fast without any risk. 3- Traction Device: A medical neck traction device in addition to military neck wrap is also sometimes recommended for in order to get a temporary relief from straight neck conditions. Using a reliable cervical traction device under your neck can well support the entire back including the cervical spine and discs to get it restored naturally in few weeks. Remember that, medical traction devices or support systems are particularly useful in promoting normal cervical curve. Although it allows a perfect biomechanical advantage to the patients, for certain patient’s condition remains to be precarious and they need to undergo spinal surgery if required. 4- Posture Correction: Maintaining a good posture, especially while working on a computer is most essential so that you can help heal your straight neck curve faster. Wearing neck brace or a posture corrector brace is specially recommended for this. While buying and using a support or a brace to correct the straight neck curve, make sure that the medical device or a support bracket is bought from a branded shop after the consultation of your doctor. 5- Supportive Neck Pillows: As such there are various different variety of straight neck pillow that can help the problem of straight neck syndrome. Therapeutic pillows for military or straight neck are most of the times suggested for suffering patients. Specially designed neck traction pillows like Therapeutica Sleeping Pillow provides necessary traction as well as maximum support to patients with abnormal or no curve. Little below we have complied down all different types of pillows that can actually help the patients suffering from military neck symptoms. 6- Military Neck Surgery: Surgical options for correction of cervical spine when suggested (as a last option) need to be executed under strict medical supervision. It has been noted that such surgeries are very often complicated which can give rise to other side effects. It is desirable for the patient to gather useful information about the doctor performing the surgery on the person. Credentials of the doctor are mostly very important in order to give the patient a better quality of life in the long run. Pre surgery or post-surgery care regime needs to be incorporated in case the patients expect a speedy recovery. In most of the cases doctors suggest regular physio-therapies of neck as well as shoulder based exercises. Walking on flat ground needs to be followed after few days, the surgery is performed on the patient to get faster recovery. A qualified orthopedic or a neurosurgeon can be of much help as they can take care of an immediate treatment regime as well. However treating the military neck problem by using best military neck pillow is one of the best treatment procedure which should not be ruled out. Studies showed that military neck is many times caused due to unsupportive pillow that does not provide proper support to the cervical region while sleeping or resting. Using 2 or more pillows at a time or using too high pillow for your neck can also result into straight neck syndrome. Buying best supportive pillow for your military neck is therefore an ultimate solution to cure the problem effectively. This will not only help in treating the condition naturally but also ensure that you sleep comfortably at the end of the day without affecting your cervical region further. Neck Roll Pillow: These types of pillow are generally meant for providing support and comfort to the military neck with pain. The pain caused can be due to bad posture problems or muscle spasms. Neck rolls for straight neck can be used 2-3 times in a day to provide relaxation to the stiffed neck muscles and straight curvature of the cervical spine. Sleeping Neck Pillow: Therapeutic pillow such as contoured orthopedic pillow is generally suggested for people who suffer from military neck without pain or very less pain. These pillows are well designed for your neck region to provide additional support to your neck and shoulders while sleeping. Not only it promotes good sleeping posture but also it ensures that your head is properly aligned by preventing it from moving too far or forward from the pillow. Based on the severity of military neck pain, specific type of pillow should be chosen to ensure that you get maximum relief from inflammation and spasms. People with very less pain can buy an inflatable pillow which comes with both the qualities. These can well maintain the shape as well as height so that you maintain correct posture while sleeping. Overall, opting for a best pillow for military neck can be a best natural way that promotes faster recovery for you. Ensure that you combine it with specific exercises and stretching to get better results. While easing the pressure in the neck region, this all helps the spine to regain its natural curve once again to make your life better.